For the metropolitan area made up by the population centers of Miami-Dade, Broward, and Palm Beach Counties, see Miami metropolitan area. South Florida (colloquially and locally known as SoFlo) is a geographic and cultural region that generally comprises Florida's southernmost counties, including Miami-Dade, Broward, and Palm Beach. It is the fourth most populous urban agglomeration in the United States. It is one of Florida's three most common "directional" regions, the others being Central Florida and North Florida. It includes the populous Miami metropolitan area, the Everglades, the Florida Keys, Treasure Coast (which includes Martin and St. Lucie county), and other localities. South Florida is the only part of the continental United States with a tropical climate. 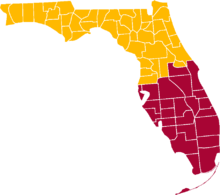 As with all vernacular regions, South Florida has no official boundaries or status and is defined differently by different sources at different times. A 2007 study of Florida's regions by Ary Lamme and Raymond K. Oldakowski found that Floridians surveyed identified "South Florida" as comprising the southernmost sections of peninsular Florida. That area includes the Miami metropolitan area (generally defined as Miami-Dade, Broward, and Palm Beach counties), the Florida Keys included in Monroe county, and the interior region known as the Glades. Additionally, Southwest Florida, representing the state's southern Gulf Coast, has emerged as a directional vernacular region. Some respondents from as far northwest as the southern Tampa Bay area identified their region as being in South Florida rather than Southwest or Central Florida. However, the University of South Florida, founded in 1956, is located in Tampa. At that time, prior to the changes quickly brought by the Florida Constitution of 1968, south Florida was much less important politically, and the term was used more loosely. Tampa is not considered part of south Florida. Enterprise Florida, the state's economic development agency, identifies "Southeast Florida" as one of eight economic regions used by the agency and other state and outside entities, including the Florida Department of Transportation. Some entities alternately designate this region "South Florida". Its definition includes much of the same territory as Lamme and Oldakowski's report (except the Gulf Coast and much of the interior Glades region) as well as additional area. It includes Monroe County (the Keys) and the three metropolitan counties of Miami-Dade, Broward, and Palm Beach. 33.0% Elsewhere in the U.S.
34.8% Outside of the U.S.
Over 87.2% of all foreigners residing in South Florida come from Latin America. 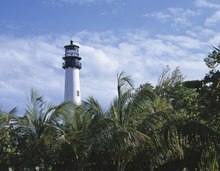 Cape Florida Light, a lighthouse on Cape Florida at the south end of Key Biscayne in Miami-Dade County, Florida. Constructed in 1825. ^ Lamme & Oldakowsi, p. 329. ^ "Charting the Course" uses "the term 'Southeast' Florida interchangeably with 'South' Florida" for this region; p. 3. ^ Haggin, Patience. "Miami Accents: Why Locals Embrace That Heavy "L" Or Not". Wlrn.org. Retrieved 10 July 2018. ^ Watts, Gabriella. "Miami Accents: How 'Miamah' Turned Into A Different Sort Of Twang". Wlrn.org. Retrieved 10 July 2018. ^ "English in the 305 has its own distinct Miami sound - Lifestyle - MiamiHerald.com". Miamiherald.com. Retrieved 10 July 2018. ^ "'Miami Accent' Takes Speakers By Surprise". Articles – Sun-Sentinel.com. June 13, 2004. Retrieved 2012-10-08. ^ Lamme & Oldakowsi, p. 330. ^ a b c Lamme & Oldakowsi, p. 336. ^ "Charting the Course", p. 3. ^ a b Morelli, Keith (May 8, 2008). "2 Broward Cities Plant Seeds of Secession". The Tampa Tribune. ^ Huriash, Lisa J. (May 6, 2008). "North Lauderdale wants to split Florida into two states". Sun-Sentinel. ^ Cutway, Adrienne. "Officials want South Florida to break off into its own state". Sun-sentinel.com. Retrieved 10 July 2018. ^ Cutway, Adrienne. "Officials want South Florida to break off into its own state". Orlandosentinel.com. Retrieved 10 July 2018. Lamme, Ary J.; Oldakowski, Raymond K. (November 2007). "Spinning a New Geography of Vernacular Regional Identity: Florida in the Twenty-First Century". Southeastern Geographer. 47 (2): 320–340. doi: 10.1353/sgo.2007.0029. Warf, Barney; Waddell, Cynthia (January 2002). "Florida in the 2000 Presidential Election: Historical Precedents and Contemporary Landscapes". Political Geography. 21 (1): 85–90. doi: 10.1016/S0962-6298(01)00063-4. Anthony J. Catanese Center for Urban and Environmental Solutions at Florida Atlantic University (2006). "Charting the Course: Where is South Florida Heading?" (PDF). Florida Atlantic University. Archived from the original (PDF) on December 16, 2011. Retrieved March 23, 2012.